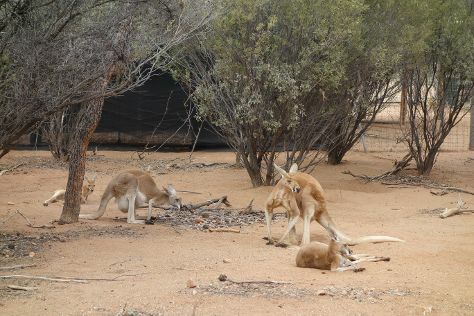 You'll visit kid-friendly attractions like Alice Springs Desert Park and The Kangaroo Sanctuary. The adventure continues: identify plant and animal life at Alice Springs Reptile Centre, explore the striking landscape of Emily Gap, take in the dramatic natural features at Henbury Meteorites Conservation Reserve, and take in the local highlights with Walking tours. To see more things to do, reviews, maps, and more tourist information, you can read our Alice Springs road trip planning app . Sydney to Alice Springs is an approximately 5.5-hour flight. You can also drive; or take a bus. While traveling from Sydney, expect a bit warmer days and about the same nights in Alice Springs, ranging from highs of 34°C to lows of 15°C. Cap off your sightseeing on the 17th (Wed) early enough to travel to Uluru-Kata Tjuta National Park. Kick off your visit on the 18th (Thu): stroll through Kuniya Walk, then contemplate the waterfront views at Mutitjulu Waterhole, then take in the dramatic natural features at Uluru, and finally stroll through Uluru Hiking Path. Get ready for a full day of sightseeing on the 19th (Fri): get outside with Walpa Gorge, then take in the awesome beauty at Kata Tjuta, and then get answers to all your questions at Uluru-Kata Tjuta Cultural Centre. 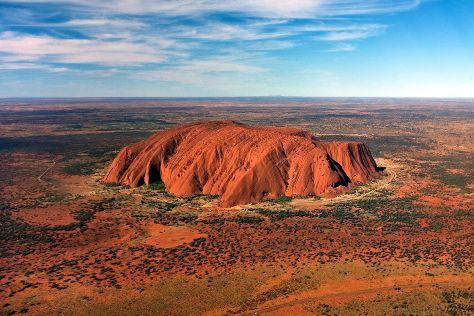 To find ratings, other places to visit, more things to do, and tourist information, use the Uluru-Kata Tjuta National Park visit planner . Traveling by combination of taxi and flight from Alice Springs to Uluru-Kata Tjuta National Park takes 2 hours. Alternatively, you can drive. In April, daytime highs in Uluru-Kata Tjuta National Park are 34°C, while nighttime lows are 17°C. Wrap up your sightseeing on the 19th (Fri) to allow time to travel to Kings Canyon. Kick off your visit on the 20th (Sat): take in the spiritual surroundings of Kings Creek Station and then see the world from above with a helicopter tour. To see photos, reviews, where to stay, and other tourist information, use the Kings Canyon trip itinerary planner. You can drive from Uluru-Kata Tjuta National Park to Kings Canyon in 4 hours. Finish your sightseeing early on the 20th (Sat) to allow enough time to travel to Coober Pedy. Start off your visit on the 21st (Sun): see the interesting displays at Old Timers Mine, look for all kinds of wild species at Josephine's Gallery & Kangaroo Orphanage, and then admire nature's extreme beauty at Breakaways Conservation Park. For maps, more things to do, and more tourist information, read our Coober Pedy planning website . Getting from Kings Canyon to Coober Pedy by car takes about 8.5 hours. Expect a daytime high around 30°C in April, and nighttime lows around 17°C. Finish up your sightseeing early on the 21st (Sun) so you can travel to Port Augusta. Kick off your visit on the 22nd (Mon): admire the natural beauty at Homestead Gardens, view the masterpieces at Port Augusta Cultural Centre - Yarta Purtli, take in nature's colorful creations at Australian Arid Lands Botanic Garden, then take some stellar pictures from Matthew Flinders Red Cliff Lookout, and finally get great views at Water Tower Lookout. For traveler tips, maps, and other tourist information, use the Port Augusta trip planner . Explore your travel options from Coober Pedy to Port Augusta with the Route module. In April, daily temperatures in Port Augusta can reach 27°C, while at night they dip to 15°C. Wrap up your sightseeing on the 22nd (Mon) early enough to travel to Broken Hill. Kick off your visit on the 23rd (Tue): explore the world behind art at Pro Hart Gallery, look for all kinds of wild species at The Broken Hill Sculptures & Living Desert Sanctuary, then take in the architecture and design of School of the Air, then don't miss a visit to Broken Hill Miner's Memorial, and finally examine the collection at Royal Flying Doctor Service, The Bruce Langford Visitors Centre. Get ready for a full day of sightseeing on the next day: contemplate in the serene atmosphere at Synagogue of the Outback, see the interesting displays at Sulphide Street Railway & Historical Museum, browse the exhibits of Silver City Mint and Art Centre, then examine the collection at Silverton Gaol Museum, and finally get great views at Mundi Mundi Lookout. For where to stay and other tourist information, read our Broken Hill road trip app . You can drive from Port Augusta to Broken Hill in 5 hours. Another option is to fly. Traveling from Port Augusta in April, plan for a bit warmer nights in Broken Hill, with lows around 19°C. Finish your sightseeing early on the 24th (Wed) so you can travel back home.